How does it look like in Studio? How would an information like this treated in an editor? Would it show also the alternate number or just jump to the right part is an element number is entered say in a search? (2019-04-07, 12:05)Willy Tschager Wrote: How would an information like this treated in an editor? Would it show also the alternate number or just jump to the right part is an element number is entered say in a search? An editor would use it as a translation table. Any format could be generated if the 3rd party names would be stored in the parts tracker as metadata. We could also introduce a new LDraw meta for this, and add it to the parts themselves. Eliminating the need for an index file altogether. in one go. Whether the file format is XML or JSON is not that important I think, but CSV might be too limited. or what is the idea? On the other hand, if I understand correctly, Willy is talking about how to expose this information (no matter how it is stored) to the user in an editor. I think from a model author's point of view there are several aspects. If I want to add a part to my model it would be most convenient if I can find it under any of its part numbers. Maybe I have found the part in a Lego model or on Bricklink or wherever and now I want to use it. On the other hand, in some situations I might want to use its number in a specific reference system. For example, I might want to look up on Bricklink how expensive the part is. Or I want to export a Bricklink XML file. 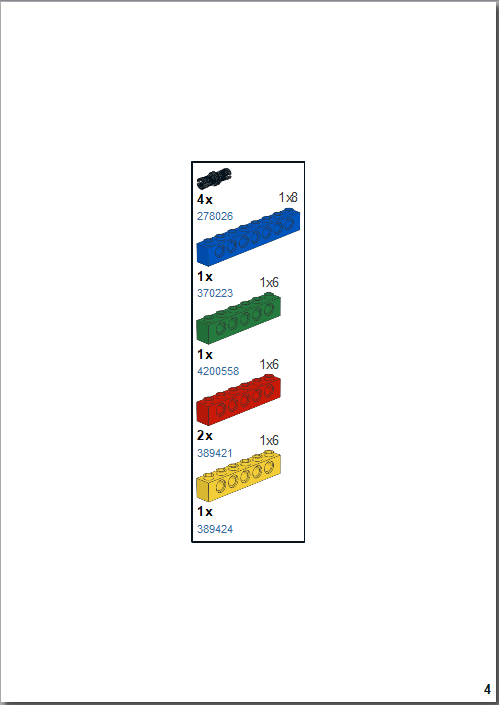 It just happened to me that I exported such a file from LeoCAD and could not import it to Bricklink before I manually translated some of the part numbers. Ideally, this is to be avoided by an editor if such translation information is available. (2019-04-07, 18:40)Roland Melkert Wrote: We could also introduce a new LDraw meta for this, and add it to the parts themselves. Eliminating the need for an index file altogether. If I'm understanding this correctly, this suggestion would be to specify the part mapping within the individual part files. Given that BrickLink's part number change over time, wouldn't the implication of doing this be that then the individual LDraw part files would need to be updated? If so, I think an index file would be more preferable. Also, if something along these lines sees the light of day, it might be worth liaising with rebrickable.com. They have a pretty good database mapping between LDraw, LEGO, BrickLink and BrickOwl part ids and a published API which might simplify the generation of any mapping file. (2019-04-08, 8:41)David Manley Wrote: If I'm understanding this correctly, this suggestion would be to specify the part mapping within the individual part files. Given that BrickLink's part number change over time, wouldn't the implication of doing this be that then the individual LDraw part files would need to be updated? If so, I think an index file would be more preferable. I think we have to have this information outside the individual dat-files. The same dat-file would be referenced in many different ElementID. The same dat-file would be used in a red brick as in a blue brick, but have different ElementID. ElementID = DesignID(shape of the brick) + colour of the brick. And to make it even worse, sometimes the DesignID mean the shape of the brick, and sometimes it means the design of the print on the brick. The same DesignID could be printed on both a 3626c.dat and on 3626b.dat. But they would have uniqe ElementID numbers. I think it would quickly become a nightmare to sort all this info correct. And why do we want our own database when all of this is already at Rebrickable or Brickset? Lets use what is already done and build on that. Fully agree with Magnus ! Last time we recycled all parts through the PT to add the licence we had a stilstood of almost two years so adding this kind of information to the single parts is a no-go. (2019-04-08, 22:24)Magnus Forsberg Wrote: I think we have to have this information outside the individual dat-files. The same dat-file would be referenced in many different ElementID. The same dat-file would be used in a red brick as in a blue brick, but have different ElementID. I followed this article with great excitement and did not understand anything at the beginning. Now that I know what is meant, I also think that we do not have to reinvent the wheel. Following the discussion... have to think about contributing. After all it was kind of "my idea..."
I think this a fairly trivial problem to solve as long as the APIs to Rebrickable and Bricklink are robust. A simple script that runs every so often to update a database and then another script to pull info from the database to auto-generate a file in the format of choice (I think JSON is appropriate). Manual entries to the database would also be available to suppliment the API data. We could even do an initial population of the data by scraping already available KEYWORD data. Maybe a front end to allow searching. I'm super worried about it being 100% accuarate, just "good enough". (2019-04-09, 21:53)Orion Pobursky Wrote: I think this a fairly trivial problem to solve as long as the APIs to Rebrickable and Bricklink are robust. A simple script that runs every so often to update a database and then another script to pull info from the database to auto-generate a file in the format of choice (I think JSON is appropriate). Manual entries to the database would also be available to suppliment the API data. We could even do an initial population of the data by scraping already available KEYWORD data. Maybe a front end to allow searching. I'm super worried about it being 100% accuarate, just "good enough". It is do-able. I've just knocked something together to process the rebrickable data using their published API. My attempt at producing a reasonable output is visible here. There are a couple of rough edges to remove from my solution but I'll post my approach and scripts on here in the morning, should there be any interest. (2019-04-12, 12:34)David Manley Wrote: It is do-able. I've just knocked something together to process the rebrickable data using their published API. My attempt at producing a reasonable output is visible here. Very nice. I think maybe we should seek a closer partnership with Rebrickable since they seem to be very LDraw friendly. (2019-04-12, 15:29)Orion Pobursky Wrote: Very nice. I think maybe we should seek a closer partnership with Rebrickable since they seem to be very LDraw friendly. I made a couple of posts over in the Rebrickable forum regarding the mapping of part ids. The potential implications of the replies is that it would be beneficial to be running some form of confirmatory query of the existence of a LDraw part id as part of the process of creating a mapping file. Is there (he wrote optimistically) any form of API available to query the LDraw parts database e.g. to obtain a list of the part ids? This could be used as part of the transformational process of Rebrickable's data to create better matching part ids. 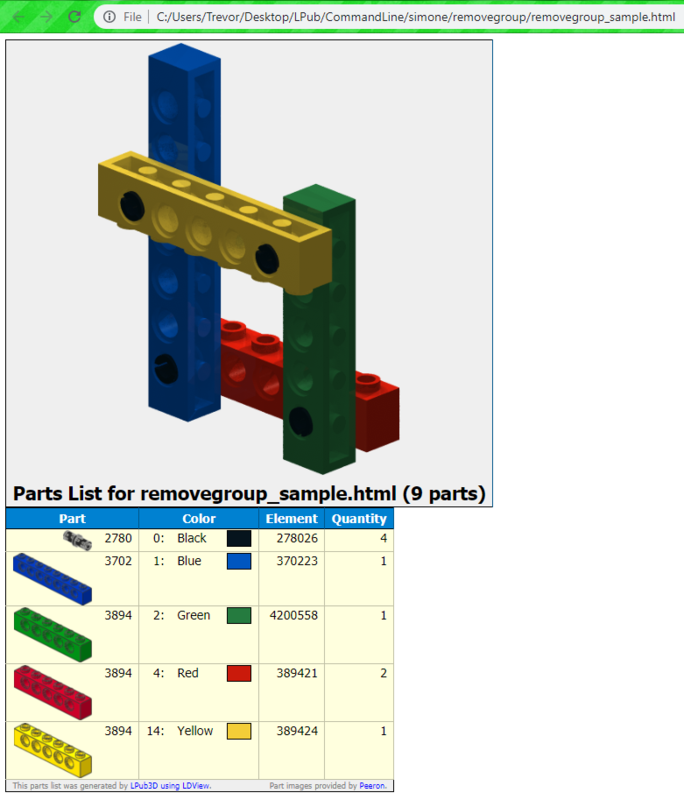 (2019-04-16, 5:50)David Manley Wrote: I made a couple of posts over in the Rebrickable forum regarding the mapping of part ids. The potential implications of the replies is that it would be beneficial to be running some form of confirmatory query of the existence of a LDraw part id as part of the process of creating a mapping file. I guess the only person who can gives a proper answer is Chris. Beside that I'd like to hear from the code-gods how the drawn information can be used in their progs? (2019-04-16, 6:40)Willy Tschager Wrote: I guess the only person who can gives a proper answer is Chris. Beside that I'd like to hear from the code-gods how the drawn information can be used in their progs? There is no formal API. All the individual parts are accessible online but the expection now is for people to download the library and collate thier own database. (2019-04-16, 15:27)Orion Pobursky Wrote: There is no formal API. All the individual parts are accessible online but the expection now is for people to download the library and collate thier own database. In reply to one of the questions I posted on the rebrickable forum, the rebrickable team came up with a question/request which, if we were able to assist with here at LDraw.org, would help them to improve their part id mapping data. This would in turn benefit us as their improved mapping would be exposed via their API and hence any transformation of the rebrickable data to LDraw/LEGO/BrickLink ids would have better information. Fundamentally, they would like to know if there is a way on the ldraw.org website to see the image associated with an official part? While using the Prts Tracker one can see an image for unofficial parts, the same is not true for official parts. The example they give is http://www.ldraw.org/cgi-bin/ptscan.cgi?...ebrickable, with the image for the unofficial part being visible in the "Details" link. There is no equivalent link for an official part and while the narrative of the approval process for the unofficial part may not be of value, perhaps the file header and imgae information could be displayed for the "detail" of an official part? A related question (from me, rather than the rebrickable team). Could the parts tracker be enhanced to add an optional parameter meaning list the part exactly matching the lookup value. For example, at the moment the link http://www.ldraw.org/cgi-bin/ptscan.cgi?q=3010 will match multiple parts, which is desirable. But could the interface be enhanced to support something like http://www.ldraw.org/cgi-bin/ptscan.cgi?q=3010.dat&exact, so the tracker would list just the single part? I replied to this on Rebrickable. I have been running this on Windows 10, using PowerShell 5. It should run on earlier versions of Windows, depending on which version of PowerShell is installed on the OS. Try it and see. While the output format appears to be okay, I need to do some checks on whether all the parts have been output. According to Rebrickable's website, they have 32 000+ parts in their database. The generated XML file currently contains 5 000+ parts. I'll to a bit of digging into this. Some rebrickable part ids map to multiple part ids in other systems. For example this part lists two LDraw part numbers. This can occur for systems other than just LDraw. My unconfirmed suspicion is that the first part number listed when there are multiple matches should be taken as the "best" match. I don't know whether rebrickable differentiates between the part id being the same between two systems (e.g. rebrickable and LDraw) and a part being only in rebrickable but not in LDraw. When the part id is the same, I think it does not explicitly identify the LDraw part id but is it doing the same thing when there is no equivalent LDraw part? Something I shall be digging in to. I keep forgetting how much I dislike PowerShell scripting. If you have issues with getting this to run, please drop me a line. The PowerShell script in the zip file has been updated. It is a bit "gentler" when querying Rebrickable and the shortage of parts being retrieved has been resolved. 2. I suggest you alter the PowerShell script part_mapping_generate.ps1 on line 48 69 and update it with the path to your installation of saxon. You can pass this value in as a command line parameter if you so wish but I suggest this will quickly become tiresome. Do something similar for the curl executable location on line 68. 3. While the output format appears to be okay, I need to do some checks on whether all the parts have been output. According to Rebrickable's website, they have 32 000+ parts in their database. The generated XML file currently contains 5 000+ parts. I'll to a bit of digging into this. This has been resolved. I believe all parts are now being retrieved. Queries rebrickable and output XML to the file abc.xml and displays progress when querying Rebrickable. Queries rebrickable, output XML to the file abc.xml and JSON interim output to abc.jsn and displays progress when querying Rebrickable. Today I was browsing through my LDraw installation folders and found this one: LdSetsConversion. Who made this? I cannot find a name or author. It sure looks like something we are trying to achieve here? Something worth looking at, I think? LPub3D has element-ID integration too in the BOM! And, using some LDView features it can create a partslist with Designnumber and Elemen-ID! (2019-04-18, 6:39)Jaco van der Molen Wrote: Something worth looking at, I think? Perhaps we are looking at the same thing here, but only in the other LDraw software.